Share information in real-time. Accelerate and improve the decision-making process. With MED e-care, clinical data flows seamlessly between the core platform and devices, allowing team members to continuously monitor and collaborate on care plans. MED e-care’s eNotes makes daily progress notes and critical incident tracking quick and easy. ePlan allows staff to create the maintain clinical care plans and classification documentation for long-term care, retirement and chronic care. eReports provide clinical decision makers with in-depth understanding of their residents’ health needs against with national data. eAssessment is packaged with a wide range of focused assessments addressing clinical and activation needs. ePlan allows staff to create and maintain clinical Care Plans and classification documentation for long-term care, retirement and chronic care. 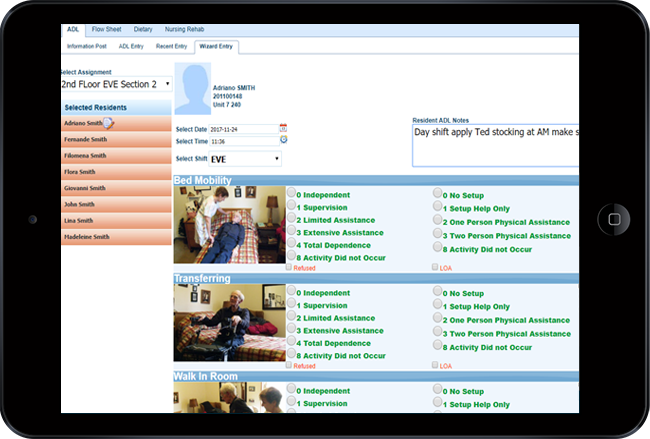 ePlan links nursing, dietary, activity and rehabilitation departments for quick and easy tracking of resident care. Facilitate smooth communication among staff and departments with the Kardex and assignment sheets, allowing for a unified working facility and a reduction in documentation errors. 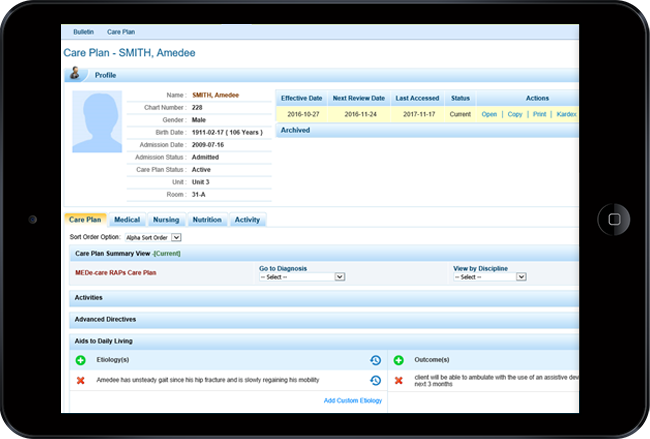 MED e-care eNotes makes daily progress and critical incident tracking quick and easy. eNotes links directly with care plans and vital sign tracking ensuring consistency across a resident’s chart. eNotes allows staff to set and monitor incident thresholds for the individual, unit and facility, and will automatically alert your supervisory team in order to maintain an optimum level of care. 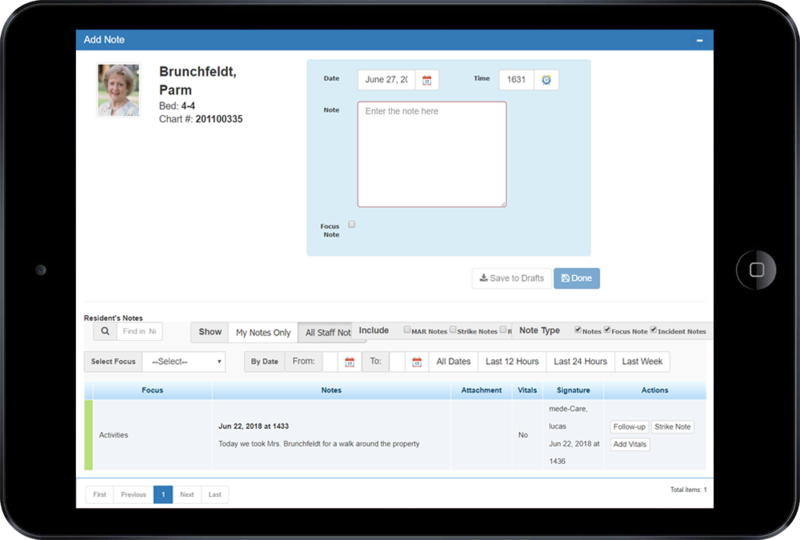 POC is designed for complete access and documentation of key resident information: care provided, dietary and fluid intake tracking, rehab services assignment, and fully customizable flow sheets directly from the resident’s bedside. Wound Tracker allows staff to document wound care, attach photographic images, track wound restoration and schedule follow-up assessments through an intuitive graphical interface.